Welcome to Meadville Community Theatre! Where community is our middle name! What side of the Mason-Dixon line you’re from not only determines the sweetness of your tea, it may also determine how you define the word “Family.” Sweet Tea & Baby Dreams, written and directed by the highly energetic Maribeth McCarthy, with Marie Loose in the Assistant Director’s seat, is a show for anyone who has ever been to a bridal shower, wedding shower, birthday party, or family reunion for that matter. Feuding-in-laws, domineering mothers and clashing cultures turn the event into a comic chaos that ultimately uncovers long-held sorrows and secrets. Nora is nervously organizing a church baby shower for her sister-in-law, Maggie. Nora, a Northerner, hopes to ingratiate herself with her husband Quinn’s traditional Southern mother, Jubilee. Maggie’s gung-ho husband Jack and his sarcastic twin siblings, Aiden and Avery, arrive to help, along with Maggie’s fun-loving friend Zee, who sneaks in bottles of wine to the dry event. Jubilee soon bursts in, with her other daughter Samantha in tow, whom she’s groomed in the ways of Southern womanhood. Jubilee immediately tries to take over, clashing with Nora over choices of decorations, food and games. When Jack and the twins’ mother, Anne, shows up, her long-held animosity for Jubilee erupts into a battle of insults and name-calling. In the aftermath, Jubilee’s three children attempt a breakthrough in their relationship with their mother. 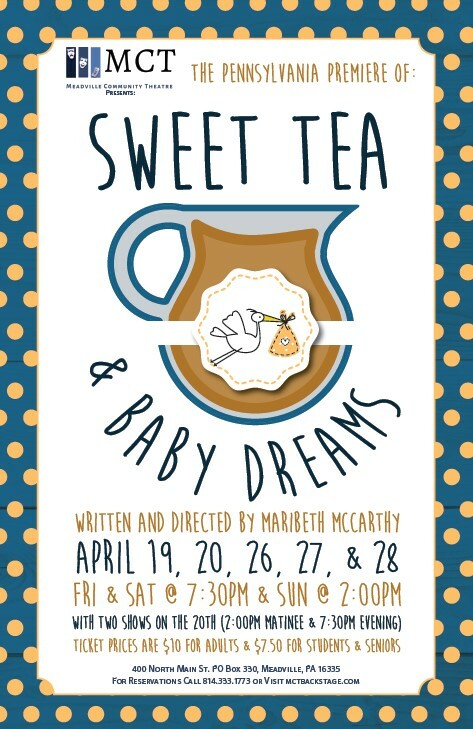 Sweet Tea & Baby Dreams runs April 19 – 28, 2019. For tickets visit https://squareup.com/store/MCT1967 or call the box office at 814-333-1773. Visit our Show/Events page for more information! 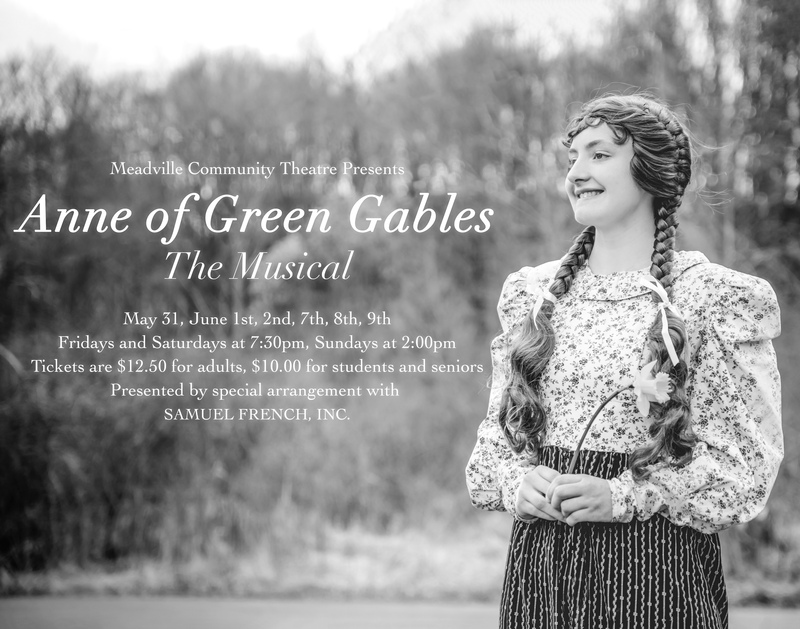 Located in Northwestern Pennsylvania, Meadville Community Theatre is a small town, non-profit organization that is run by community members for the enjoyment of the entire community. 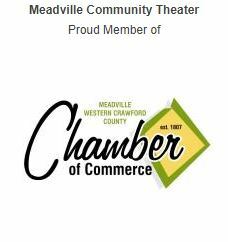 In operation since 1967, Meadville Community Theatre is the oldest all volunteer community theater in Crawford County. The purpose of MCT is to foster active community theater, and to offer education, training, and opportunity for dramatic expression to all members of the community. And, of course, visitors from outside the community are ALWAYS welcome to come join the fun and watch a show.